What appeal makes a lot of people back into the White Crater Patuha, Ciwidey. A clear plateau of South Bandung is beautiful. So much inspiration at every corner for the camera shots in the "haunted and authoritative" white crater. When a Dutch wanderer named Junghun came in the 19th century, locals refer to the white crater as the place where the ancestors dwell, which no one was there without dying, the birds were reluctant to fly above it. 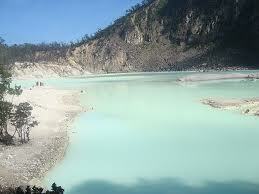 True that the White crater Patuha it authoritative, because of its height and its solitude. True, that the white crater was haunted, that merely because of concentrated sulfuric fumaroles to be reckoned with when the wind stops. The rest of white crater is a place where the incarnation of paradise once relegated to the earth, so elegant, quiet, exotic. Between July and August temperatures can drop as low as 10' C in the daytime and at night 5'C. A breeze carries away the fog of concentrated sulfuric vapors away. Firmly yell; purported to be forwarded by the echo of his padas walls to heaven. Walking around the crater during the dry season is quite easy to do; looking for points of view that perhaps forgotten runoff from heaven. Visitors will not stand for long buffeted by the cold mountain winds that sneak into the bone marrow. Bandrek sips at a stall in the parking lot capable of providing a sense of warmth in the throat is dry. The atmosphere of silence in that place will bring relaxed atmosphere. Your inner resonance with the nature around capable of filling the battery life replenished. Patuha white crater is not the only place that should be hunted in Ciwidey. Many other places around the store for a million charm that would bother chasing wayward paradise.